One of the best biographies, I have read so far, although I had to re-read some of Einstein’s concepts to make myself clear for the next move. The progression from one part to the other is like moving a higher level with respect to Einstein’s journey and getting to know more of him at personal level. Before reading this book, I have always wondered had Einstein not discovered the theory of relativity, what would have happened to physics. But the answer wasn’t too difficult to find, there would have been an ether theory revolving around the same principle. And this would have come to the fore somewhere around the mid twentieth century unlike the beginning of the century, which is the present case. Brownian motion and theory of relativity were in rudimentary in quantum mechanics Einstein helped them reach shore. At the same time, there are invaluable and breakthrough contributions like ‘photon paper’ and the ‘duality of quantum mechanical wave-particle’. His contemporaries Bohr, Schrodinger, DeBroglie and Heisenberg together might have reached the latter’s conclusion but (I’m sure) not alone. Einstein’s life since the very beginning, his hatred towards Germany, his work in Switzerland and then academics in Germany again, his family leniency towards religions & spirituality, his love for physics, his journey during world wars & inclination towards Zionism in later years of life is all majestically ingrained by the author. In addition, Clark did a fantastic job in explaining the most complex theories in physics for laypersons like meself, his involvement in politics and his role in the invention of atomic bomb. Unlike the books that I have read so far, this is the second one that is not a fast read, first being Dawkins’ The God Delusion. 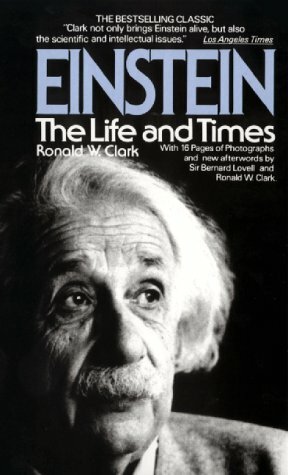 Overall, an exemplary work done by Ronald W. Clark in introducing us to the life and world of man with the most phenomenal intellect Albert Einstein.